Take your biggest pots - up to 26 gallons - and automate them. The Javo Unimax XXL brings automation to the biggest trees and shrubs. The machine is built on an extended Javo Unimax frame. TThe Unimax XXL takes away the heavy work of large pot filling by turning the pot and putting a computer-controlled dose of soil each pot - and it can hold up to 99 programs, changed simply with the push of a button. 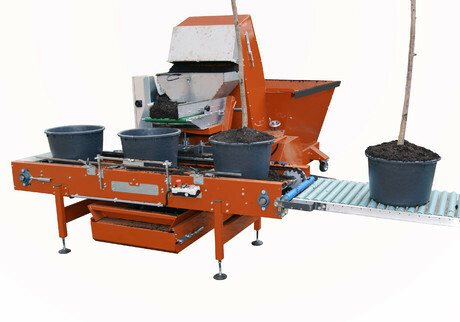 It's bar conveyor automatically positions the pot, turns it, then moves it into the take-off position. As with all Javo machines, the soil return system ensures the substrate stays in the machine, reducing spilled soil, contamination and disease. With the ability to move more than 39 cubic yards of soil per hour, the XXL is the answer for filling large pots and boxes.